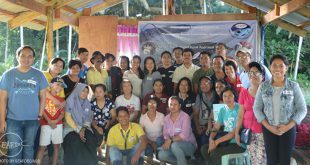 The training course, held mostly at the Binangonan Freshwater Station, focused on freshwater fish farming and included lectures, practical sessions, and tours of fish farms across Rizal, Nueva Ecija, Iloilo, and Guimaras. Representatives of fisheries agencies from Benin, Cambodia, Cameroon, Fiji, Kenya, Myanmar, Nigeria and Zambia attended the training from 8 to 24 October which was funded by the Japan International Cooperation Agency (JICA). 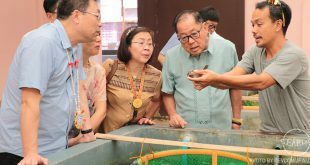 Atsushi Saga, general manager of Marino Forum 21, a Japanese non-profit organization implementing the training in partnership with SEAFDEC/AQD, said they chose to conduct the training course in the Philippines because the species being cultured here are like those already being cultured in the trainees’ home countries. During their stay, trainees were hands on in the breeding of carp, freshwater prawn, catfish, and tilapia. They also had sessions on ecology, design and construction of aquaculture systems, feed preparation and aquaponics. SEAFDEC/AQD and JICA are set to conduct two more similar trainings in the Philippines annually until 2020. Vincent Ireri Kanyua, Assistant Director of Fisheries at Kenya, said he was sent by their government to address the low productivity of aquaculture systems in their country. 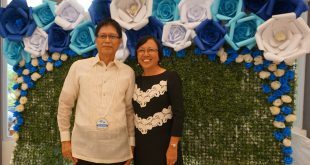 “The main purpose for me to be here is to learn more technologies and see how the Philippines, for example, have been able to have a high production, let’s say of tilapia where they become number three globally,” Kanyua said. With Kanyua’s exposure to SEAFDEC/AQD’s thrust to reduce the cost of aqua feeds, he has become intent to similarly examine their locally-available feed ingredients back in Kenya as a way of reducing the production cost for small-scale fish farmers. “Many things that we have a problem at home I can see some beginning of solutions at SEAFDEC here,” said Segla Bienvenue Toviwazon, Rural Development Officer of the Republic of Benin, while revealing that their country relies on importation to fill a shortfall on fisheries production. “Through the lectures that I received from SEAFDEC here, I see that even on a small scale, people can choose broodstock and still get a better result, instead of us bringing broodstock from outside the country with all the problems and complications,” Toviwazon added. Ojo Kingsley, Assistant Chief Fisheries Officer at Nigeria, remarked that the aquaponics setup he saw at the Central Luzon State University in Nueva Ecija spawned an idea of how aquaponics could also be incorporated through his outreach programs of promoting aquaculture in Nigeria as a means of boosting small scale fish farmers’ incomes. “If the farmer is harvesting fish here and harvesting vegetables here, it’s another source of income to boost the standard of living.” Kingsley remarked after seeing lettuce being grown using water from a fish pond. 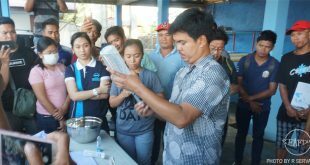 Mr. Libanga Ochola, a fisheries training officer from Zambia, revealed that because of his experience in the Philippines, his office will be enhancing their scheduled training in Zambia to benefit about 50 small-scale fish farmers. “For the first time, when I go back home in the next few weeks, we are going to include fish breeding and feed processing as a topic for small scale fish farmers. So, you can see the importance of this training here,” Ochola said.